A Hawaii Volcano Observatory geologist maps the margin of the June 27 lava flow in the open field below Cemetery Road near the town of Pahoa on the Big Island of Hawaii. Lava has been flowing from Hawaii’s Kilauea Volcano toward the village of Pahoa (in the district of Puna on the Big Island) for months, but it’s avoided threatening any population centers until now. Authorities have recommended residents evacuate by Tuesday. 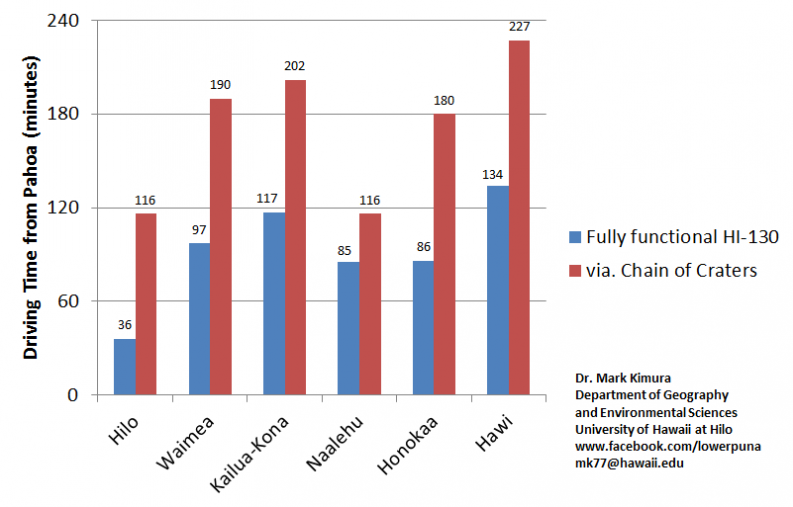 But a lot of factors play into the decision of whether to stay or to leave, and so one researcher at the University of Hawaii at Hilo, Mark Kimura, decided to try to help inform residents — and represent their interests — with data visualizations. I spoke with him Monday evening. The following interview has been lightly edited for brevity and clarity. Hayley Munguia: What made you decide to start looking at this data? Mark Kimura: I’d heard the news here last month, in mid-September, and I was having dinner with my friends. We sat and talked about it, and I wondered how many people were affected by the lava flow. I wanted to know about the social ramifications of the lava flow, so with my background and my affiliation with the university, I had a lot of experience with databases — sociographic databases. So with that knowledge, and having this online resource called Community Analyst, I went back home and drew the line to Pahoa, to Hawaiian Beaches and to the Hawaiian shore — and I found that there were 5,000 people in that area. Five thousand people, what does that mean? It was huge, but I wanted to know how many students, what kinds of businesses, and it took off from there. Initially, I posted the maps on my personal Facebook page, and I changed the privacy setting to public just to see if people would respond. I wasn’t expecting it would explode like it did. In a short time, it was shared by 500 people. So then I realized that I needed to go beyond my own Facebook page. And because of people’s responses and comments, telling me how they used it and how helpful they found it, I started to feel responsible — curiosity wasn’t my primary driver anymore. I wanted to help people. HM: You look at a lot of different types of data in this project. How did you decide which points to investigate? MK: It has really just depended on what’s been happening. The very first day, the purpose was to get some understanding of the area in general. So my focus was to get a demographic profile. That was the main stuff. There were also things that were not data-driven, just visualizations that were based on the lava flow. One of my top priorities was using a format people are familiar with and that they would find useful. After that, I decided to do more to help people, so the next thing I did was to estimate the driving times. So I created a before-and-after look at what commutes would be like. We don’t yet know if the lava flow will hit the ocean, but if it did, the only way out would be a much longer road. Another thing I wanted to do was create infographics or pictures or whatever you want to call them, basically to draw more attention from the rest of the world. This is not a wealthy county, so I wanted to increase the potential to get some help for the area. So I made some basic infographics for that purpose as well, looking at the average income of the residents. I also studied the lava flow and decided to create a progress chart, which shows the relationship between the flow and Highway 130, a road that everyone uses. Oh, and also, I transposed the lava flow into different cities, just to show the size and scale of it. One other aspect I looked at was the economic impact on different important industries, such as the papaya industry. 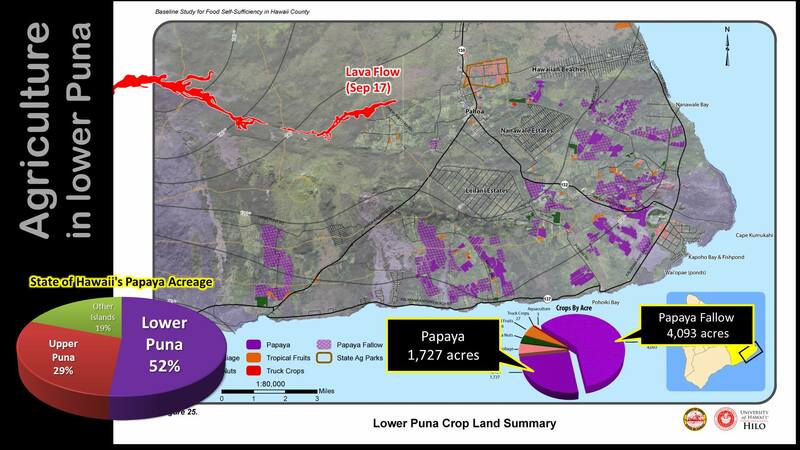 The papaya production throughout the whole state is pretty concentrated in this area. HM: You also included surveys of local residents. What was that process like? MK: One of the things the county needed to know was if people were to stay, what would the resulting population after the area gets isolated look like? We don’t know for sure. Talking about human behavior is never exact or definite, so it’s impossible to build a good model of that kind of thing at this point. Because of that, it’s really important that we try to find any data we can and keep updating it. 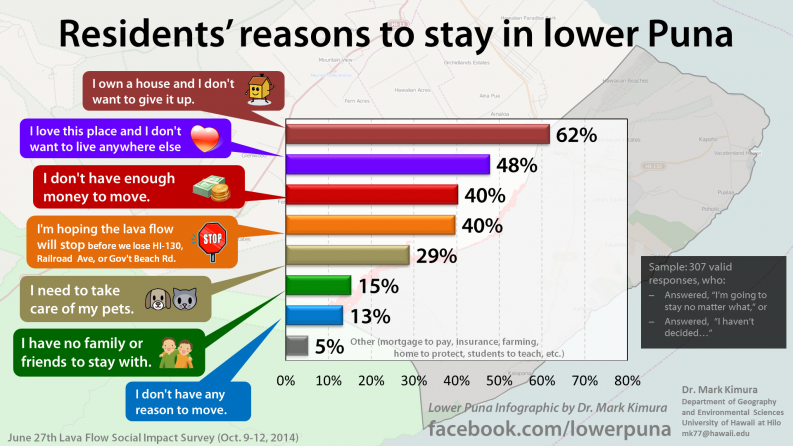 I designed a survey that asked people what they planned for, if they were staying, leaving, things like that. I got some help from the mayor’s office in distributing it. But a surprising byproduct from the survey was that at the very end, I had open-ended questions where people had the opportunity to express themselves — and the comments were heartbreaking. So I learned that this information was something that people actually needed, but I didn’t know that until after the fact. HM: Do you feel like you’ve accomplished what you originally set out to do? MK: Initially, I didn’t think that this information would be that helpful or appreciated, but I was so wrong. It seems like people actually appreciate and benefit from it. I can’t just assume that I’m accomplishing my goals — it depends on how people are using the data, and what decisions they’re making based off of what I post. I just like to keep going.